There’s a baby bird on the ground and he seems to be all alone. What do you do? This is a common thing to see during nesting season. 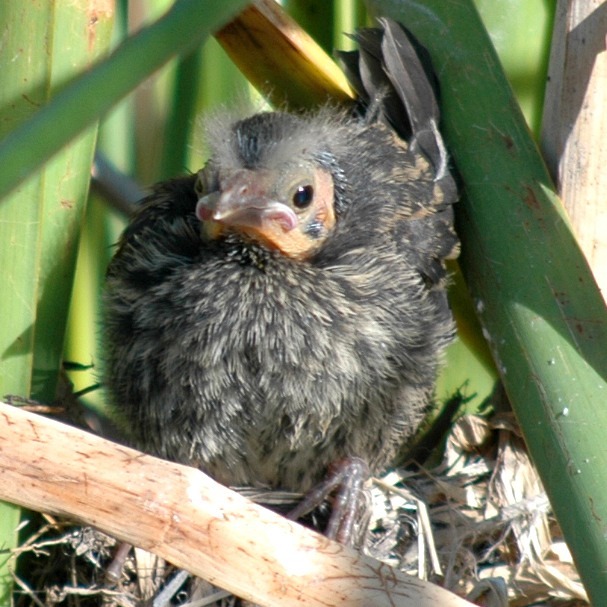 If the baby bird looks too young to be out of the nest and you can locate and reach the nest, put him back in the nest and then leave the area to watch from a distance. If you are too close, the parents may not come to take care of him because they see you as a threat. 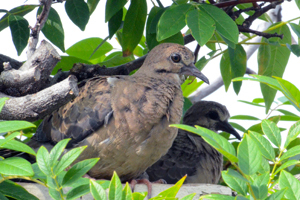 If the bird seems fully feathered (like these Mourning doves), he might have just fledged (left the nest). If he just flew out for the first time, he may still not be able to fly very well, and the parents will stay close by and feed him on the ground for a few days as he becomes a stronger flier. If you see a baby bird that seems to be alone, don’t scoop him up! Nearly every baby bird on the ground has a parent hovering close by waiting for the chance to unobtrusively feed and care for their baby. It’s always best to let the parents take care of their babies as they know exactly what to do. If you haven’t made sure your cat or dog are indoors during nesting season, this is a good reminder to immediately take them inside! These few days on the ground are the baby bird’s most vulnerable time, and a dog or especially a cat, which is outside will make short work of these young birds. Sometimes just their presence in the are is a distraction that keeps the parents busy keeping the animal away from the nest and they can’t take care of their chicks. Kids may inadvertently harm the little bird who is helpless on the ground, or may frighten the parents enough to keep them from feeding the baby. So if you find a little bird on the ground, keep the kids from giving him attention. It’s actually a lot of fun to watch the parents taking care of the baby bird from a distance – it’s amazing to see them in action! If you have been observing the baby bird for awhile with no one disturbing the area and have not seen any parents attending to him — maybe the baby is peeping loudly for food for a long time and has not been fed — he may well be alone and need some assistance. Only if you are sure the bab y has been abandoned, put him in a dark box and place him in a quiet area to calm him while you check for a wildlife rehabilitator to take him. It may be tempting to let everyone look at him, but this causes too much stress on the baby bird. And, don’t try to give him food or water. Try to get him into the hands of a licensed rehabilitator as quickly as possible as this person will know exactly what and how to feed him. Even well-meaning attempts at feeding him could cause more harm and stress. The best choice is always to let the parents do their job, and it gives you a chance to see exactly what they do. Our thanks to the folks at Adirondack Wildlife Refuge and Rehabilitation Center for the helpful advice.